This 1963 low-budget gore-fest is a first of its kind. Widely acknowledged as the first splatter, Blood Feast is by no means a great work of art. However, there is no denying how ahead of its time this was. Directed by Herschell Gordon Lewis, a Pittsburgh-born maker of “nudie cuties,” who moved into the horror culture when the latter died out, anyone who calls themselves a horror fan has to check this out. 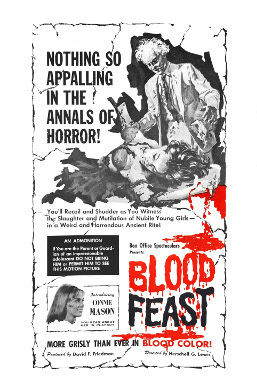 Blood Feast features a psychopathic food caterer who kills women so that he can include their body parts in his titular feasts and perform sacrifices to his “Egyptian goddess” Ishtar. Some ineffectual cops, unfamiliar with cause and effect, have a problem figuring out the denouement. The nastiness still holds up. 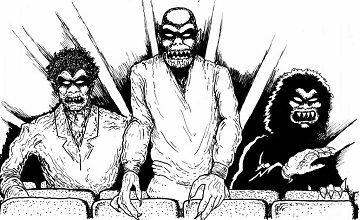 Check out the DJ Kool Herc of horror, the first of its kind.